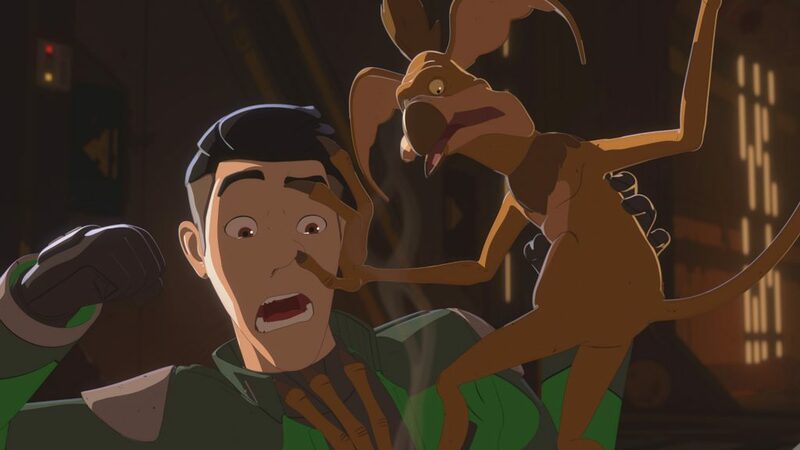 A growing problem for Star Wars Resistance is Kaz Xiono. 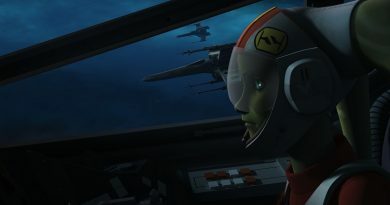 The centerpiece of the show, New Republic navy pilot become Resistance spy, Kaz has failed to really evolve from being the same character introduced in the show’s premiere. 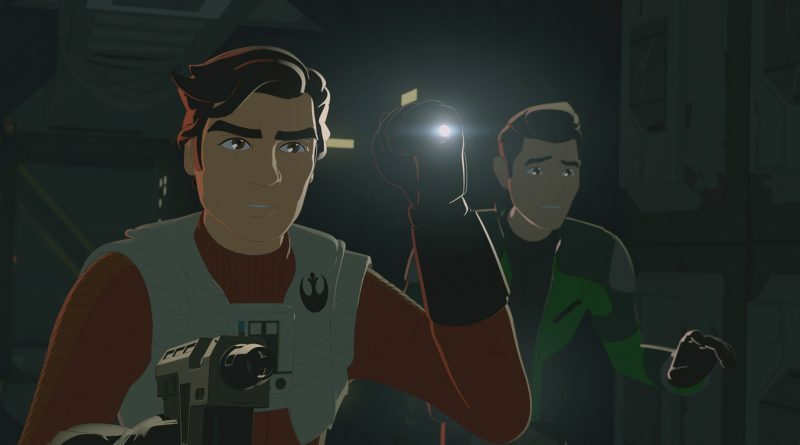 Assuredly, there have been small steps forward at the conclusion of most of the episodes, but in “Signal from Sector Six,” when cast beside Poe Dameron, the lack of advancement is striking. By no fault of Kaz’s actor, Christopher Sean, who brings an excellent performance to every episode, the scripts seem determined to relegate one of Star Wars‘ first person of color leads to almost comic relief status at times. This may be by design given the fact that in a very short while Kaz likely will lose his family currently living on Hosnian Prime. Nonetheless, outside of this frustrating delay in character development, “Signal from Sector Six” was a fun Poe Dameron lead romp underscored by Oscar Isaac clearly enjoying himself in the process. The episode begins with a weary Kaz dragged from his bunk by Yeager for a nebulously phrased “salvage job,” off station. In this instance, Kaz is everyone on Monday morning, trudging to get his caffeine fix, and bleary-eyed with regard to his surroundings. He only perks up later in a shuttle when Yeager reveals that Poe Dameron is in the vicinity. 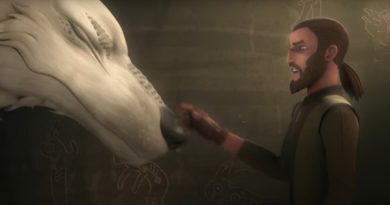 For anyone dealing with anxiety over the length of time Poe and BB-8 have been separated, the episode acknowledged it; the absence was noted by both parties upon being reunited, ever briefly, as Dameron offers to debrief Kaz in a relaxing X-wing flight off planet. One of the amusing aspects of the sequel trilogy are the X-wings, which are a more advanced model than the T-65s of the original trilogy era. Everything about them seems new: their sleeker lines, more nimble cut, and altered engine layout. But in the galaxy far, far away, these T-70s are still considered outdated – we were blessed with the most recent Incom model in the show’s opening scene – a fact that Dameron references off-handedly before the pair zip off out of the atmosphere. The sound work on Resistance continues to stand out, in this case, the familiar scream/hum of the X-wings as they fly across the screen and the pair temporarily go to play in an asteroid field. In Empire asteroid fields are a last ditch effort to evade certain death by Imperial star destroyers; in Resistance, for Poe Dameron, they are a playground and opportunity to teach new piloting tricks. Not long into the space rock fun, a distress signal chirps from the coms and the two pilots fly off to investigate an old freighter, seemingly in the midst of a pirate attack. 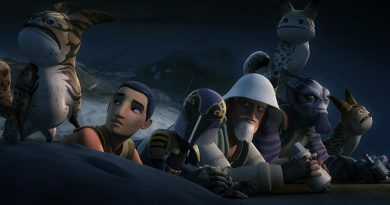 Poe and Kaz, along with their respective droids – the new one is CB-23, a shout-out to Carrie Beck, Lucasfilm Vice President, Animation and Live Action – tentatively explore the ship in search of a life sign. Not long into the exploration, they realize that something far worse inhabits the ship, Kowakian monkey-lizards and something, even nastier: big, green, and possessed of giant rancor-like clawed hands. Be it Jabba’s lair or Hondo Onaka’s hangout, in no situation have Kowakian monkey-lizards proved themselves as anything other than annoying pests. Poe repeatedly concurs with this sentiment as the monkeys continually harass our heroes while they search for survivors. Two such potential survivors are briefly found only to be dragged out of sight by whatever monster is stalking aboard the ship. For those with a good recall from “The Triple Dark,” two hints have now been dropped with regard to which group of pirates attacked the ship. First, outside the ship were some “uglies” that resembled the pirate ships from that episode, such as the one which had TIE striker wings. Second, one of the two survivors whom we glimpse on their way from going from survivor to meal, was a Trandoshan who looked very much like one of the pirate attackers. This leads up to the discovery of a Mirilian woman hiding inside a crate. A hasty retreat with the survivor with harrowing escapes from the aforementioned monster, the newly introduced Kowakian ape-lizard, and the episode wraps up with the woman being provided shelter on the Colossus. The final reveal is that the woman is actually one of the pirates, too – shown in “The Triple Dark,” granted wearing a mask – and her newly bestowed status as a registered resident of the station will help the pirates achieve their First Order ordered gains. “Signal from Sector Six” highlights where a lot of the emphasis has been placed in Resistance, weaving in a season long arc regarding the First Order and the platform with minor adjustments being made for character development. Either character development has decidedly been given second tier status or the powers that be have envisioned a lengthy enough run for the show to allow these incremental developments to build up over time; i.e., Yeager’s rebel and family past, Tam’s dreams of being one of the ace pilots and past friendship with Hype, and so on. Kaz learns a little patience in this episode when it came to pulling off a piloting stunt, but whereas some writers would then have this lesson become applicable on a larger scale (appreciating an approach to spying on the platform) or in a significant way later in the episode (dealing with the Kowakian horrors), it doesn’t really happen here outside of Kaz literally using the maneuver against a pirate fighter. Across the season, this has often been the case for our hero, learn something, then apply this knowledge – such as in “The Triple Dark,” when he uses the screeching noise he accidentally discovered to thwart the pirate attack. It’s not bad or lazy writing, but it misses the opportunity to grow Kaz as someone who’s learning something about himself or the bigger world and not just how to figure out the next puzzle piece to come his way. One aspect of the show which has never wavered has been the production value of Resistance. The soft morning glow of Yeager’s shuttle and Poe’s X-wing gliding in the clouds above the watery planet were dream-like, while the direction felt well applied, be it how the shots were framed to the timing of events. The moment of sheer surprise when Poe accidentally shoots one of the monkey-lizards and the shocked expression on Kaz’s and another monkey-lizard is priceless. It sums up a common problem when it comes to any Lucasfilm animated work: production is amazing, the writing can sometimes be head-scratching. That said, “Signal from Sector Six” was a fun episode to watch, especially with Poe Dameron’s lengthy participation. Outside of the Poe Dameron comics, one is hard pressed to see Poe this active in the field. It’s a delight. Hopefully, future episodes will start to focus more on the characters themselves, than necessarily making sure to push the plot forward. The latter does tell a story, but the former make you care more about it. For more information on “Signal from Sector Six,” and Star Wars: Resistance, check out the episode guide at StarWars.com!